Spectrum has a unique pedigree for us. He is a Kingman grandson on the top, and That'll Do Unbelievable on the bottom. I think the best quality of Spectrum is the consistency of his mother. Each year, she raises a bull calf that looks just like 2A, or a heifer that is one of our favorites. She is low maintence, and has never been in our barn. Cows like that are ones to build around we think. Spectrum was sold to Willow Creek Ranch to breed as a yearling, and we brought him back to Alberta to continue breeding the commercial herd in 2013. 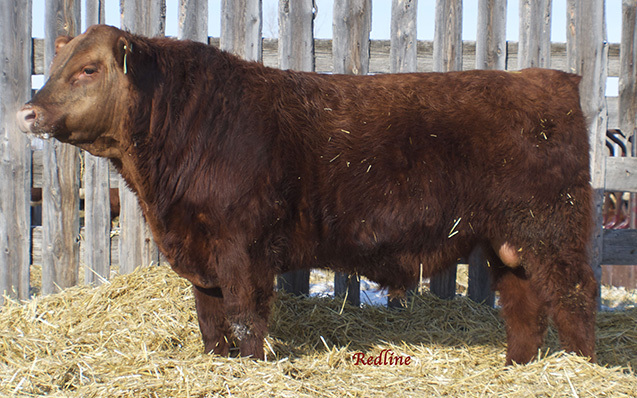 He has been used on heifers and cows alike, and his females are entering our herd and proving to be attractive and productive red baldy cows.